Welcome to Luna Station Quarterly’s first ever themed issue! Call her Wise Woman. Call her hag (at your peril). 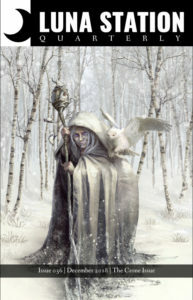 Call her Grandmother or Calliach or Baba Yaga or whatever name the winter hills whisper where you are from. As these thirteen authors show, there are as many manifestations of the Crone archetype as there are places on earth. Each has a voice, and each has a story to tell. The sun is muted and the days grow shorter. It’s time for quiet, and for inner work. It’s time to meet the Crone.